Angelia Brown walks in with a student and leads him to the other children as they begin storytime. We chat a bit under the swaying letters, shapes, and numbers hanging from the ceiling until storytime ends and the class moves on to free play. She’s a kind faced woman with an infectious smile, and the kids are drawn to her like magnets. Angelia sits down with Hunter to read a book and play with blocks together. Angelia and Hunter work together to build a castle. Angelia is the teacher’s assistant for this room. With six grown children of her own, her love for the kids in this classroom is evident, and it’s that same love that enticed her into the Child Development Associate (CDA) Credential ™ program through Smart Beginnings Southeast. Katie Sloan, Smart Beginnings Southeast’s Coalition Coordinator, with students in the homemaking learning corner. 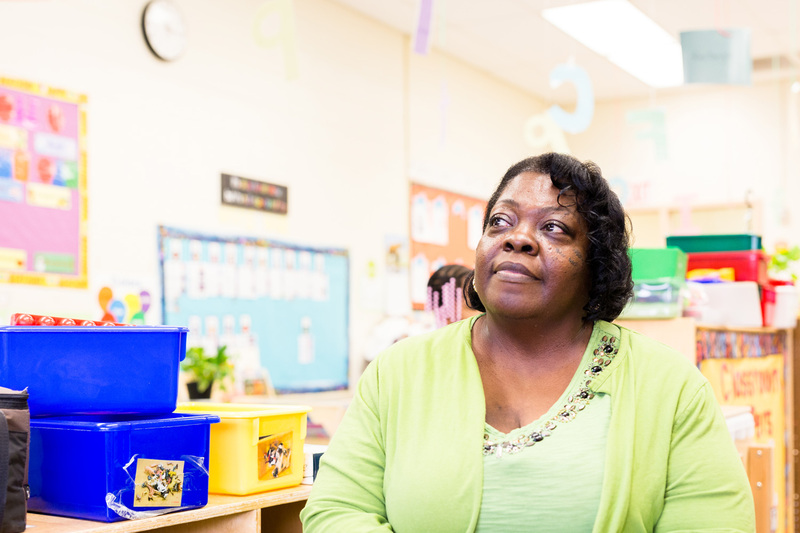 That Head Start position landed her at Woodlawn, but Angelia didn’t just earn her CDA through Smart Beginnings, she’s gone on to take advantage of a number of other programs that Smart Beginnings offers like college classes and certifications. Angelia takes a moment to look out her classroom window. 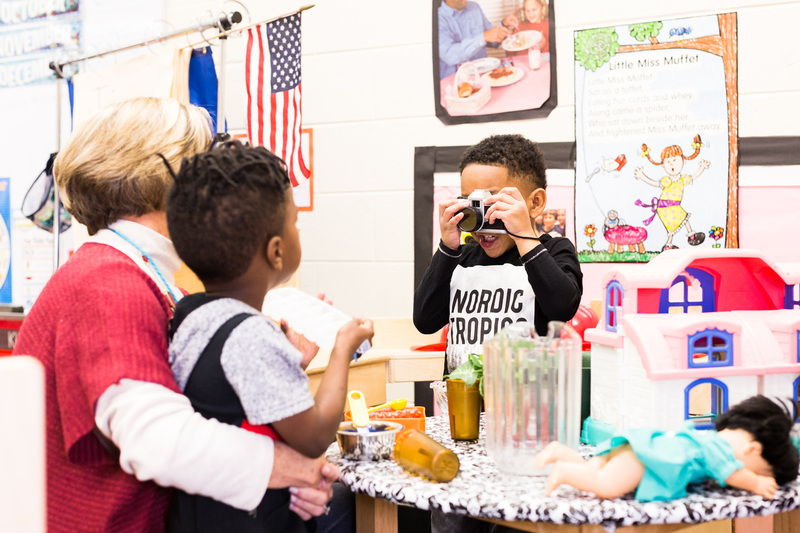 John Randolph Foundation provided a grant to Smart Beginnings Southeast to ensure that children are prepared for school – emotionally, cognitively, socially and physically. Investing in children at this early age is crucial to closing the educational gap between poor and wealthy children. The grant from JRF supports programs like the CDA program offered to Angelia and her peers. Better training for childcare providers means that more children will have quality educators from the very beginning. “It has been an amazingly rewarding experience to watch our teachers grow, develop professionally, and influence the lives of the children they teach…. Angelia Brown and her peers absorb all that they are taught because of the passion they feel for the work they do! They take all that they learn back to the workplace. The John Randolph Foundation has made many of these opportunities available. When a child gets off to a great start, their life journey is limitless!” said Katie Sloan, Smart Beginnings Southeast’s Coordinator of Programs and Community Impact.